Last month I showed some workings for a piece about the New Forest. It was for this year's open exhibition at Mottisfont (the National Trust house near Romsey), on the theme "open spaces". 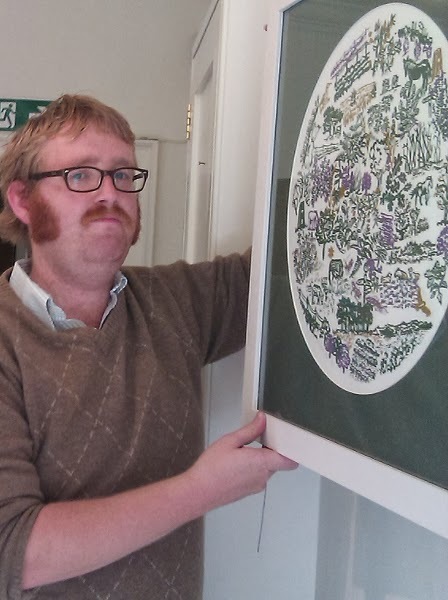 I produced a three-colour screenprint together and it was accepted by the selection panel. The forest was my natural response to "open spaces". The area of heathland south-east of Lyndhurst, down Beaulieu Road and across Yew Tree Heath is my favourite destination for an escape from town. I wanted to depict not only the tiny details of gorse, fern and heather, but also the signs that the forest is a human landscape: trig points, telegraph poles, pylons, sign posts, the obvious management of coppices, cattle and ponies and the constant flame of the oil refinery in the distance. If I were starting the piece now I would be tempted to make reference to John Betjeman's passage about Lyndhurst in "First and Last Loves", in 1952. People say you cannot properly see the New Forest from the main roads and they are quite right. But on a warm evening you can smell it between the wafts of petrol scent which linger on the tarmac - the resin scent among the conifers, the coconut smell of gorse on an open heath, the tropic scent like the Palm House at Kew under oaks and beeches, where holly shines and bracken is a young green. Outside Lyndhurst the forest begins to look less wild. Victorian brick cottages peep about among the trees. Lodge gates stand guard to winding drives of laurel and azalea, at the end of which - how deep, how far, who knows? - are the country houses of the formerly rich. Now one of my seven prints is nicely framed and up on the wall. Even better... I hung it myself. I've been on holiday and I need to tell you about it. I'm turning the lights off, so settle down for my slideshow, with a flexidisc of local music in the background and a plate of well-travelled foreign sweets. including the opera house and the royal theatre. The first thing that Adam and I did, after leaving bags at the hotel and finding coffee and cake, was to go up the Rundetårn for a view. 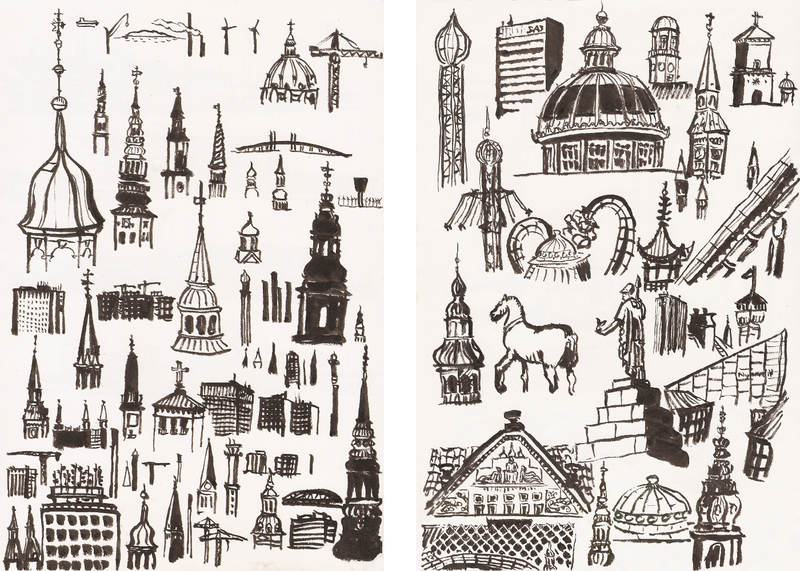 The first impression is that Copenhagen is bristling with spires and steeples and spirals and spikes. I filled a page with towers of all kinds and in all directions, not knowing yet which were the main sights. The view from the Rundetårn, on the first day, and the Glyptoteket, on the last. I fixated upon the "pile-of-onions" construction, which I suppose has a proper name. There will be a half-dome on top of a balcony, on top of an onion dome, balanced on a ring of balls, on top of an another onion dome, on top of a colonnade, on top of another dome, on top of a belfry. 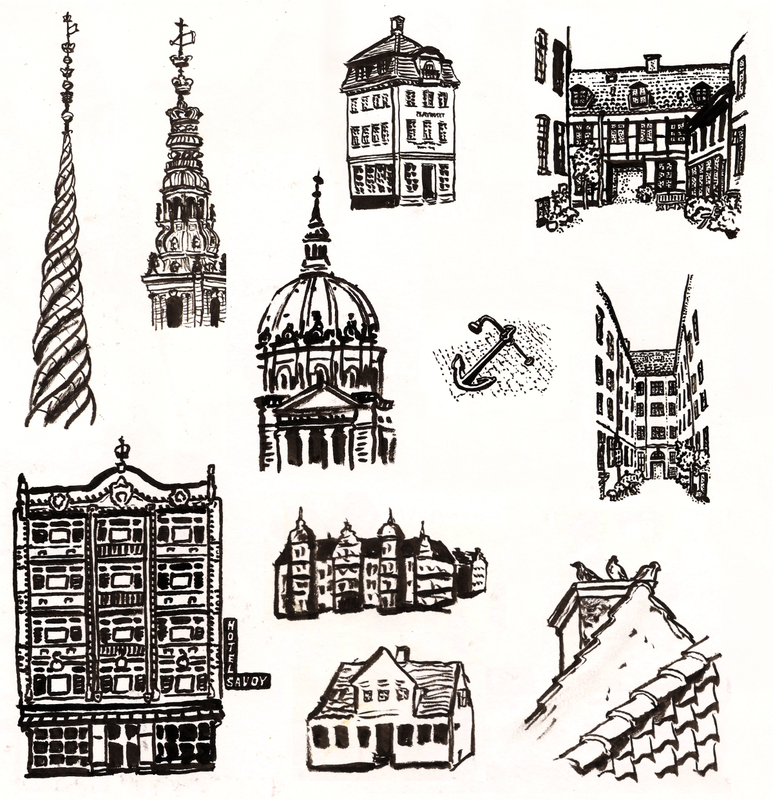 The most important buildings are topped off with a series of crowns before the weathervane and cross. The little roof café of Illum department store became one of our favourite places to drink coffee and play with panoramic functions. On the last day we found another terrace, on top of the Glyptoteket (helpful translation: Glyptotek), a large museum of antiquities, palms and impressionism. It's right by Tivoli gardens and the fairground rides that are the source of screams that punctuate the day. The waterfront gives a different kind of view. Studded along it are grand modern edifices: the Royal Library (the "Black Diamond"), the Royal Theatre, the Opera House, modern apartment blocks and now a new sliding bridge from Nyhavn to Christianshavn. I spent a lot of time sitting and sketching, changing cartridges over, letting watercolours dry - or giving up and taking photos to work from later. 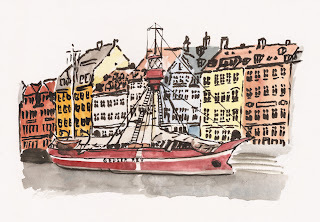 Nyhavn is the main tourist strip, being a picturesque row of coloured harbourside houses. If you've seen a guidebook to Copenhagen or Denmark, it's probably on the cover. For those arriving on tours, it's the first destination. Coming from any other direction, as I did, it is currently obscured a little by the ongoing work on a new underground line. I'm a sucker for a lightship, so here is the Gedser Rev. 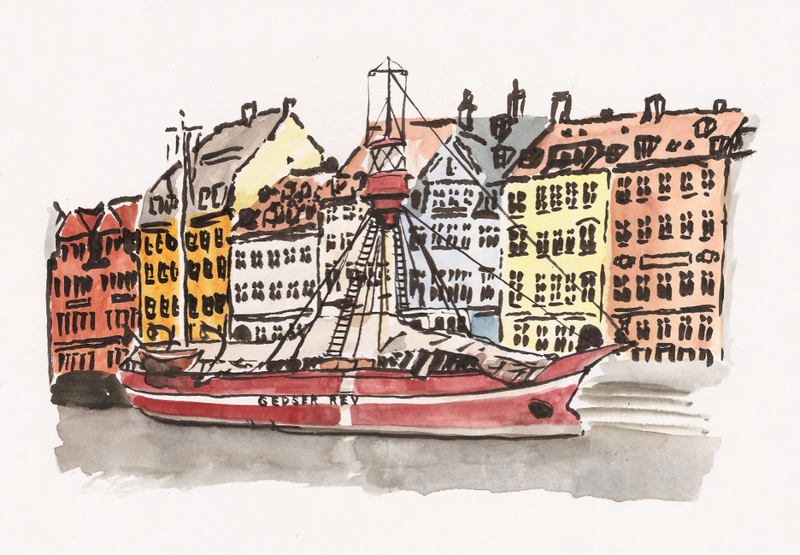 The colourful waterside buildings of Nyhavn. Building work is a peppercorn in the sugarbowl of urban holidaymaking. It's hard not to be disappointed when the picturesque fountains are dry, the boulevard is being torn up and the station is surrounded by fences. 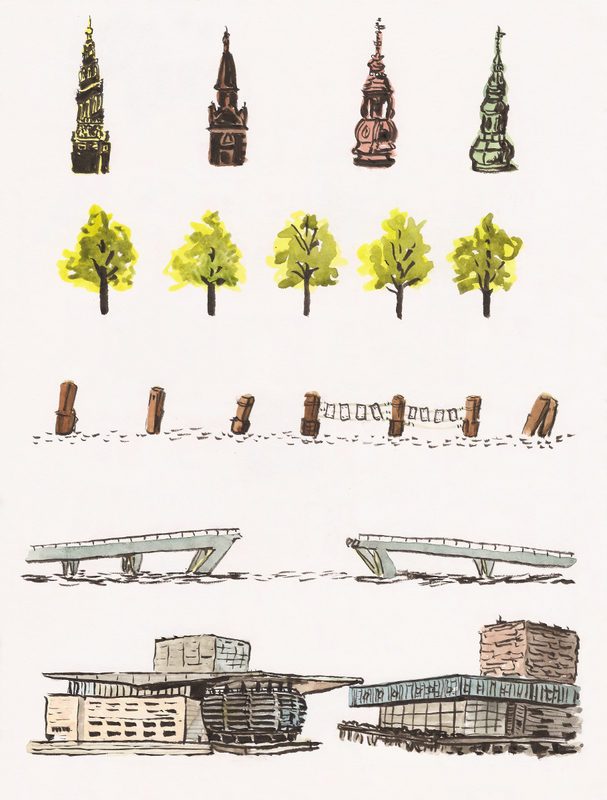 I've already mentioned the underground work in Copenhagen, and I'm sure it's a wonderful thing in the long term. Rosenborg Castle was semi-shrouded. A local paper showed one of the statues being lifted from the roof for safety during renovation. 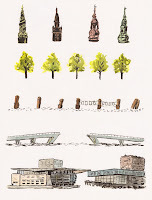 The modern buildings are dotted about too. 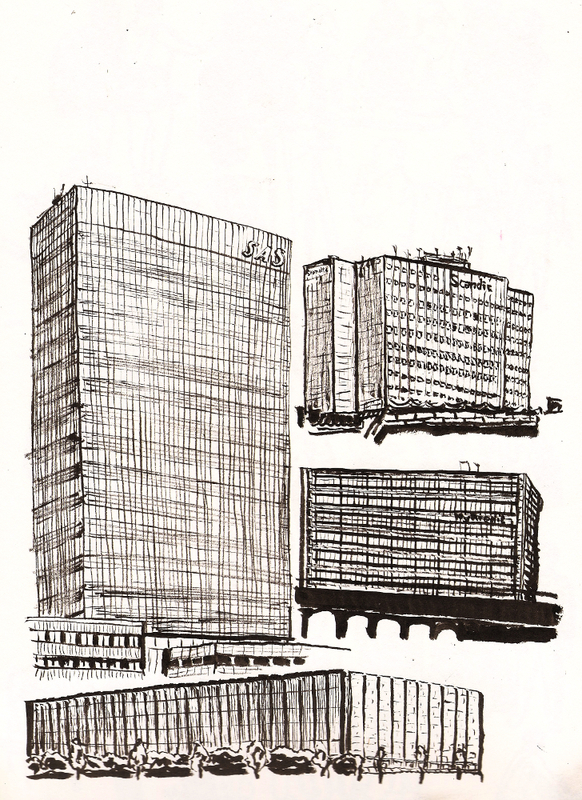 We marvelled every day at the international style SAS hotel. 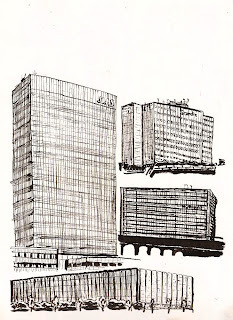 The national bank headquarters are like the SAS building lying flat, and clad like a fortress. Nykredit has a whole plaza of buildings with glass, sharp angles and gaps underneath. 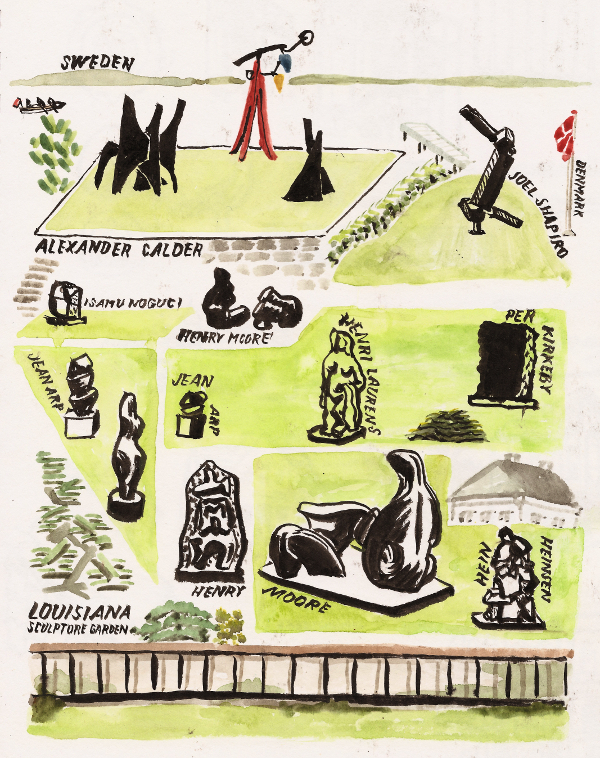 The sculpture garden at Louisiana. We took a train up the Öresund coast to Humlebæk to visit Louisiana. 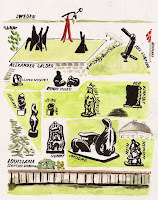 The gallery holds 20th century modern art, ancient pottery and a temporary exhibition of Yoko Ono, but the main attraction was the garden full of Danish and international sculpture. 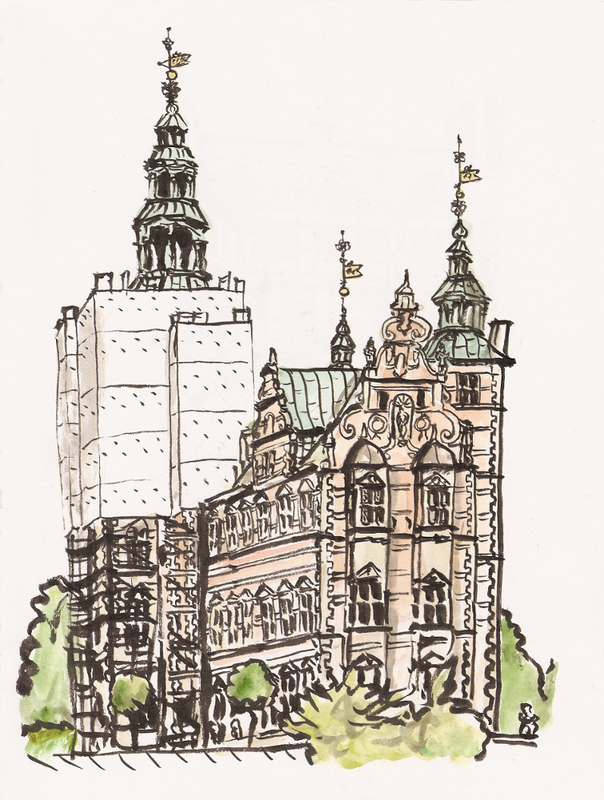 I sat on the manicured lawn, first in very gentle rain and later in hot sun, drawing the stones and looking across to Sweden. A few miles further north is Helsingør. Being not only the setting of Hamlet, but the shortest journey for booze-cruising Swedes, everything is as cartoonishly Danish as possible, in its run-down way. The streets are hung with flags; the ferries chug in and out, and the shops declare the price comparisons for various spirits. Adam calls it a cross between Dover and Stratford-upon-Avon. 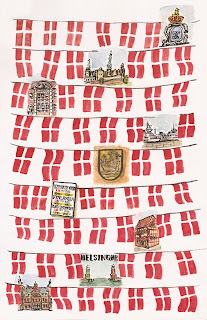 I started drawing on the train back, thinking that I must look like the most patriotic little Danish boy, filling a page with red and white flags. 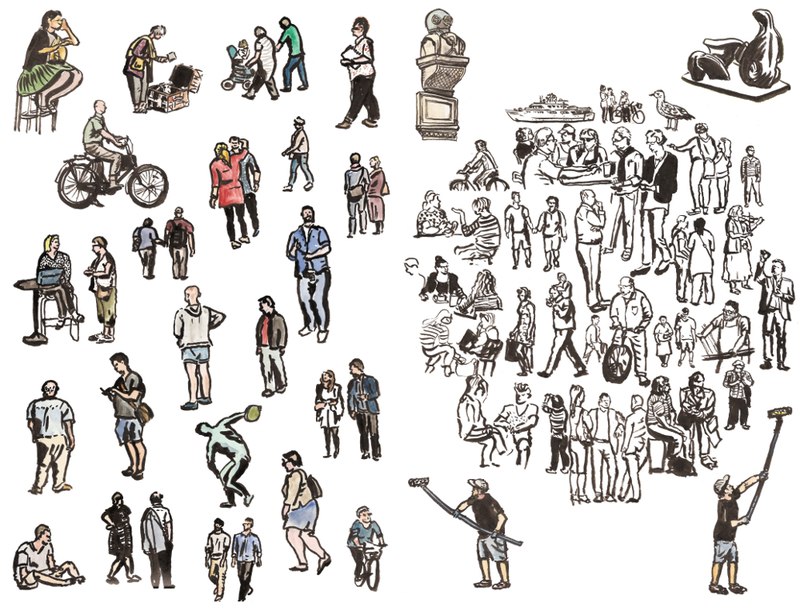 To finish off, here is a jumble of people. I've arranged them for a two-page spread in a newspaper, which I hope will all go ahead in the next few weeks [EDIT: it did!]. I didn't get to include the English morris men, some of whom were on our flight home, after performing on the waterfront. Airports are not easy when you're covered in bells. 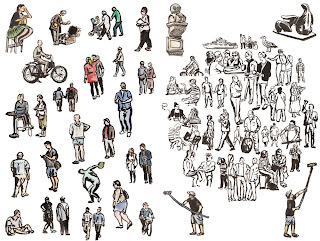 A spread of people drawn on holiday. Here is one of my rare nature moments, from a few years ago, at university. I was experimenting with texture in screenprinting. I wanted to build dense prints from layers of simple strokes and flecks. This piece was intended to be a subtle evocation of damp, velvety mosses on a wall. The staff were not at all sure what I was trying to achieve with this variety of blobs and smudges. I put it down as another instance of me having some atavistic feeling in my head that doesn't translate into reality. My five-layered screenprint of moss. Moss, lichen, heather and grasses have two associations for me. The first is homely and human: a part of nature that sits, semi-cultivated, in a human environment, the subject of diligent but leisurely botanical study; knowledgeable but twee. I see shafts of dusty sunlight in the country gardener's shed in an Edwardian children's book. The second is primal and timeless: windy, prehistoric or post-apocalyptic heath and fenland, silent but for a few marsh birds or the sound of a Jute being scalped in a bog; ancient buildings fallen to ruin and repopulated by unassuming but patient plantlife. Most of the time I need to make pictures relatively quickly. In my case, that leads to a lot of little people, buildings and boats. 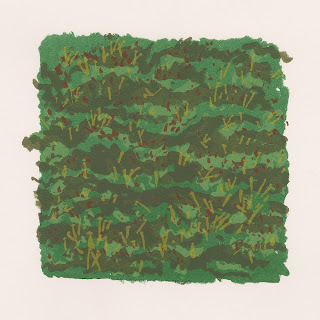 But I could enjoy spending weeks in a print room, making backgrounds, surrounded by pots of honesty and heads of pampas grass, studying the leaf-structure of heathers and hebes... and drawing them with a more refined series of blobs and streaks.